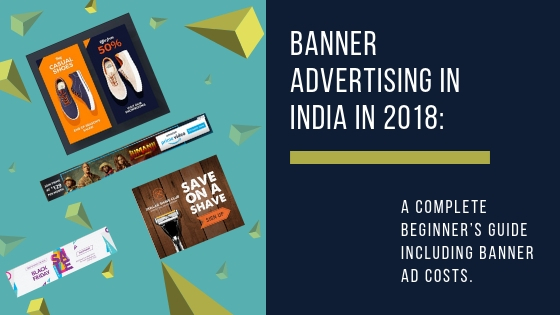 Banner advertising in India is still one of the most sought-after means of online advertising in 2018. It is the most primal form of online advertising as banner ads first came out in 1994. Ever since, they are everywhere- on almost every website, social media platform, YouTube channel. Take a look at the first banner ad that came out in 1994. This ad had a CTR of 44% and was run by Wired Magazine. This article is written from an advertiser’s point of view and aims to equip the advertiser with the information required to plan and set up a well-executed banner advertisement campaign in India in 2018. Drive traffic from the host site to the advertiser’s website for lead generation etc. As we have already established, banner ads are visual in nature and are usually used to drive traffic from the host’s site to the advertiser’s site. Their main aim is to grab the most attention and for this reason, they are designed in such a way and are visual in nature. It has been proved that visuals attract the most attention when advertising and if you make them interactive, they prove to be more effective. A static banner is an image or text with graphics in it. Static banners are usually jpg, png & gif files and their file size is easily accepted by most publishers. They are not interactive in nature. Static ads work well on mobiles too. There are 3 types of animated banner ads. The most popular and preferred type is the one created in HTML 5 as these files load easily and don’t require any additional plugins to view. This format is also supported by every web browser. Animated GIF’s can be used but they don’t provide that high-quality appeal that can be achieved through HTML5 banners. Flash ads are as good as redundant as they require a flash player to view and the files sizes are much heavier too. Banner ads are usually rectangular in nature. They are displayed either on the top or bottom of the webpage. Leaderboard Banner Ads – are displayed on the top or bottom of the webpage. Skyscraper Banner Ads – are displayed on the sidebars of the webpage. Each platform- Facebook, Google, YouTube, LinkedIn has its own specifications for banner ads. 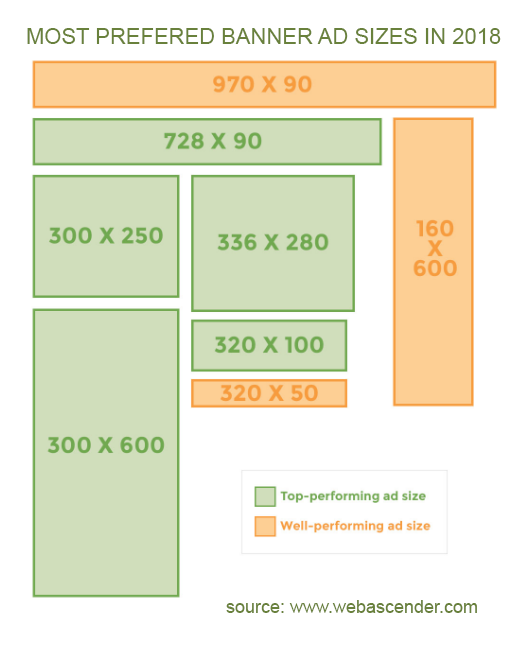 View the entire list of banner ad sizes here. The maximum file size as per Google is 150Kb. Google Adsense also offers information on the most popular banner ads country wise which you might want to look up before selecting your ad size. Bannersnack.com– You can also create HTML5 banners at Bannersnack without basic knowledge of HTML5. 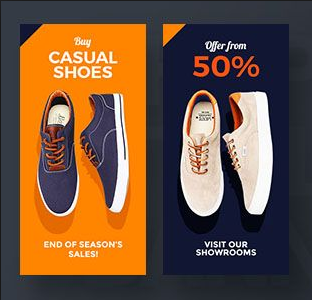 Canva.com– This platform has many great static ad templates you can choose from. Both these platforms have paid and free versions. Earlier, advertisers would directly communicate with the websites they wished to advertise on. Today, all of this is done through Banner Ad Networks. Ad networks help advertisers find advertising space on websites. All of this is done using technology – through a central ad server. The central ad server matches the advertiser’s requirements with the advertising spaces available. Then, based on the website visitor’s search and the type of ad, the central ad server makes a suitable match. On finding suitable matches, an auction takes place. (RTB) Real-time bidding is the process used to bid for the ad space in the time taken by the ad to load. The winning ad at the auction is displayed by the central ad server. Banner ads are also known as Display Ads and most advertising platforms like Facebook, YouTube, Google etc. have their own DISPLAY NETWORK which includes their partner websites on which your banner ads are displayed. Programmatic Advertising (super-targeted advertising) came in to effect in 2006 when Facebook ads entered the online ads market. Programmatic advertising is of great benefit to you as an advertiser as it allows you to laser target your audience and also buy impressions in advance. Some popular ad networks are Google Ads, Google Adsense, YouTube Facebook, LinkedIn, Media.net which is run by Yahoo and Bing. View this list of some popular ad networks in India in 2018 besides the usual ad platforms like Google, Facebook etc. Cost per impression (CPI) – The advertiser pays for every webpage visitor who sees the ad. Cost per click (CPC) – The advertiser pays for every website visitor who clicks on the ad and visits the advertiser’s webpage. Cost per acquisition (CPA) – The advertiser pays for every action that is taken by the website visitor- like a purchase or a download or a subscription to an email list. The rates for tier 1 countries like USA, Canada, the United Kingdom are much higher as compared to tier 3 countries like India, Philippines etc. The type of ad format you have chosen. You can choose to run your banner ads in India either on desktop, mobile, video sites or in applications. Many banner ad costs are in USD so your costs might get affected by the USD to INR exchange rate. The ad size factor will also come into play while you are being billed. Native ads (in-feed, in-image) $ 0.85–1.65 CPM= INR 59.5 – INR 115. You can also take a look at some rates from a popular Indian advertising site here. Display advertising is where you should never compromise on the quality of your creative. Put yourself in place of your target audience and make a note of their online habits- where most of them hang out online, what do they like and what type of content they consume, what colours appeal to them, their hopes, goals and desires. Once you have researched all of this you can use these to design your creative. Display your logo and company name very prominently on your banner ads. Use your brand colours and restrict fonts to one or two at the max. There should be consistency in your brand image. Always include a suitable CTA (call to action) button. Your text should be well spaced out and not jumbled and do not underestimate the power of white space in your ad. Use rich media if you can instead of static ads. The more interactive your ads are, the better are your click-through rates. Things like being able to mouse your mouse cursor around to do fun things are still a big hit with almost any audience. You need to be testing your ads constantly to come up with what works best in your case and don’t forget that simplicity is the key. Being exposed to many ads daily, the consumer has, to a certain extent learnt how to ignore them. But that doesn’t mean banner ads don’t work. In fact the world over, display ads are growing once again as they are more trendy and effective in capturing a prospect’s attention. Since 2017, YouTube has also restarted banner ads.